The notes include English translations of all the songs, plus background information on each one. The kora, for which Keur Moussa is best known, is a mix between a harp and a lute, possessing (traditionally) twenty-one strings that run in two divided ranks and are held in notches on a bridge, and a resonating chamber built from a large calabash cut in half and covered with cow skin. Koraists hold the instrument upright, using the thumb and index finger of both hands to pluck the strings in polyrhythmic patterns. When played in the traditional style, the music bears resemblance to flamenco and delta blues guitar. Originating in the sixteenth century among the Mandinka people of West Africa, the kora is played in Senegal, Guinea, Guinea-Bissau, Mali, Burkina Faso, and the Gambia. Traditionally, koraists come from jali families (French griot; Wolof guewel; English bard); that is, they serve as a repository of oral tradition—as historians, genealogists, and storytellers—and pass on this role, and requisite knowledge, to their descendants. However, since the latter half of the twentieth century, kora playing has extended beyond this framework, such that some players do not belong to a jali lineage, and they often perform in different contexts. 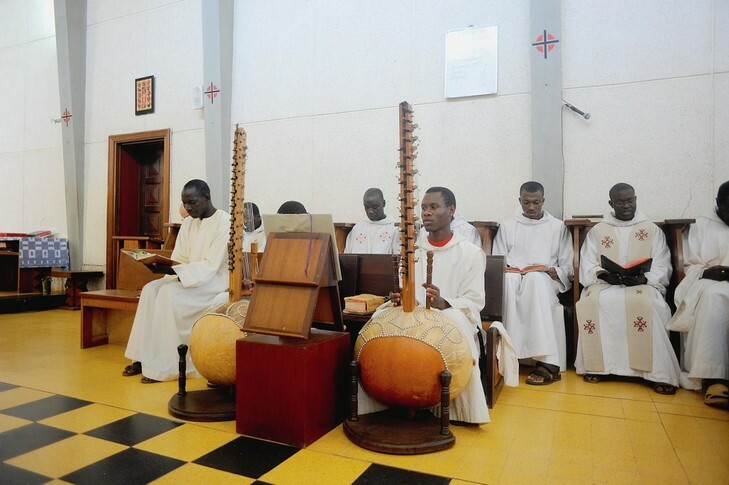 The founding monks of Keur Moussa were trained on kora by two jalis, after L’Institut fondamental d’Afrique noire (IFAN) gifted the abbey with a kora. But over time they adapted both the style of playing and the instrument itself for liturgical use. Traditional koras are not chromatic (that is, they cannot play “sharps” and “flats”), so they lack a degree of versatility; moreover, learning to tune them properly is just as difficult as learning how to play them, and the leather rings bound around the neck (called konso rings) don’t hold the strings’ pitches very long before needing adjustment. In 1971, to allow for easier tuning, Br. Michael Meugniot replaced the konso rings with conical wooden knobs, which required an elongation of the instrument’s neck. In the 1980s Br. Luc Bayle further modified the design by replacing the wooden knobs with metal ones and adding levers that allow for easy switching between major and minor keys. The monks at Keur Moussa produce and sell these chromatic koras, as well as give lessons on them to music students from around the world, both lay and religious. All incoming monks learn how to play the kora. In a 2009 interview, Br. Jean Baptiste, who is Senegalese, said that the use of the kora in mass enables him and his African brothers to worship in spirit and in truth. Keur Moussa has a YouTube channel, where you can watch masses, see the grounds and interior of the abbey, and hear more of the beautiful music produced there. Not only does the liturgical music of Keur Moussa Abbey represent a fusion of cultures; so does its artwork. The gridded, four-by-five-tile reredos in the chapel has iconographic features in common with western European art, but the biblical characters are Senegalese. The recurring figure of Mary (the abbey’s namesake), for example, wears a traditional embroidered boubou and a head wrap. Life of Mary reredos by Dom Georges Saget, Keur Moussa Abbey chapel, 1963. From bottom, left to right: Annunciation, Visitation; Visit of the Magi, Nativity, Presentation in the Temple, Flight to Egypt; Jesus in the Temple, Wedding at Cana, Jesus Meets His Mother on the Way to Calvary, Deposition, Empty Tomb; Ascension, Assumption of Mary, Pentecost. Agnus Dei ceiling design for the Keur Moussa Abbey chapel. Jesus, represented by the central lamb, is surrounded by the twelve apostles and by angels. Other artworks can be found in the abbey’s newsletter archives and, sparsely, across the Internet. My repeated efforts to contact the abbey for further information on these works, such as artist name and year of composition, were unsuccessful. The Keur Moussa Abbey refectory also contains a painting of the Resurrection of Christ. Three visitors pose in front of a Madonna and Child statue outside Keur Moussa Abbey in December 2013. Scenes from the life of Joseph. Around the central portrait of Joseph resting a fatherly hand of blessing on the Christ child, my best guesses for the scenes represented are (clockwise, from bottom left): Joseph’s Betrothal to Mary, the Nativity, the Flight to Egypt, Jesus in the Workshop of Joseph, the Boy Jesus in the Temple, and the Death of Joseph. Click here to view additional photos from Keur Moussa Abbey and village, by Robert Harding. 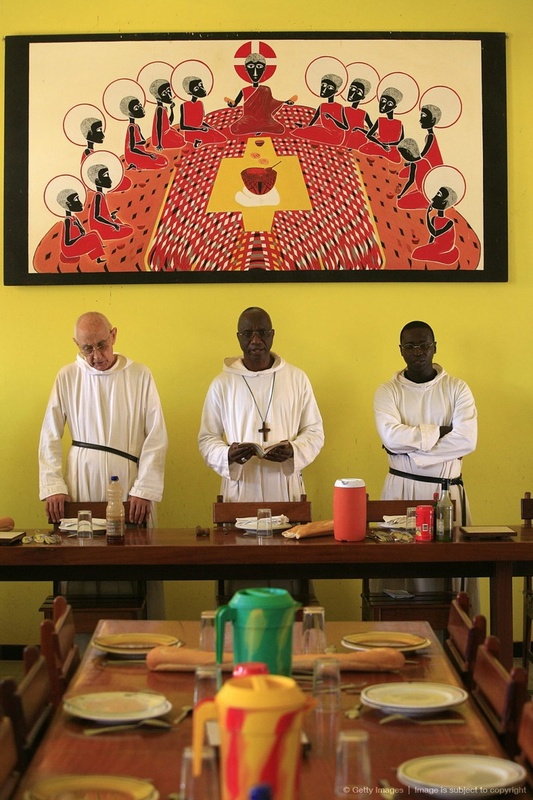 Not far from this community of brothers is a community of sisters at Keur Guilaye Abbey, founded in 1967 by Benedictine nuns of St. Cecilia’s Abbey in Solesmes, France; it, too, is home to both French and Senegalese, and the two abbeys often worship together and collaborate on projects. A cycle of paintings depicting scenes from the life of John the Baptist surrounds the chapel at Keur Guilaye Abbey, with Christ in Glory serving as backdrop to the altar. Here the brothers from nearby Keur Moussa lead a portion of the sisters’ Jubilee Service, celebrating fifty years. Christians line up to attend Keur Guilaye Abbey’s Golden Jubilee celebration on April 27, 2017. Keur Guilaye Abbey was elevated from the rank of priory in 2008, and just this year it celebrated its golden jubilee. Its official name is the Abbey of St. John the Baptist, and to that end its chapel interior boasts a fresco cycle of the life of this saint, this forerunner to Christ. The following images are screenshots I took from the YouTube video “Jubilé d’or Keur Guilaye”; the labels are ones I’ve given them and therefore don’t indicate their official titles. John the Baptist can be identified as the one in a ragged red-and-blue garment, and Jesus is the one with a cruciform halo. The central image in the chapel, however, is a fresco above the altar depicting Christ seated in majesty between the Virgin Mary and John the Baptist, displaying his glorified wounds. Opposite this, on the west wall, is a large crucifix, the corpus sculpted but the cross and the rest of the scene painted directly onto the wall. Again, Mary and John flank Christ. The sisters at Keur Guilaye are also known for their kora playing, a rare practice among women (traditionally, it was restricted to men). Their music can be heard on the album Voici l’Agneau de Dieu (Behold the Lamb of God). Frère Dominique Catta et Frère Luc Bayle, “La kora de Keur Moussa,” Voix d’Afrique 85 (1991). Emily Merkert, “Learning the Kora in Two Senegalese Contexts: As a Tradition vs. As a Religion,” Alfred University, Spring 2009. I love this music. However I speak very little French but want to sing along. I’ve lost the CD cover 😢. Is there anyway I can get the lyrics in the Senegalese French especially for Offices du Dimanche and in particular Encore in peu de temps. I have lyrics only for the 17 songs on Keur Moussa: Sacred Chant and African Rhythms from Senegal, which doesn’t include the two you mention. Sorry! I love this music as well!!!! Where can I get the lyrics in English??? Thank you! 2. O Jerusalem, here we are within your walls, in the city so firmly bound together, to which the tribes go up, the tribes of the Lord. 3. As was decreed for Israel, to praise the name of the Lord. Thrones of justice have been set there, the thrones of David’s house. 4. Request days of happiness for Jerusalem: let peace reign in your tents, joy within your walls! Peace unto your castles. 5. Out of love for my brothers and friends, I ask for peace. Out of love for the house of God, I pray for your happiness.